Samyang make an Udon flavored instant noodle called Pojangmacha. The packaging of these noodles closely resembles the Pojangmacha packaging and these appear to be a rebranded version of those noodles. I suspect that the Pojangmacha brand is sold within Korea where the customers would be familiar with the term meaning a street vendor. 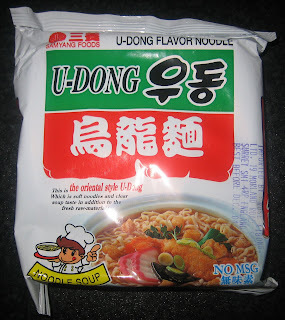 Outside of Korea, most people would be unfamiliar with the term and it would simply be sold as U-Dong Flavor Noodle. I was very relieved to find that the stiff piece of seaweed in Pojangmacha has been eliminated in this package. The noodles are Samyang's typical product: thick, chewy, and flavorful. The broth is quite mild but has tastes of onion, salt, and fish. There are tons of scallions to provide bursts of flavor. 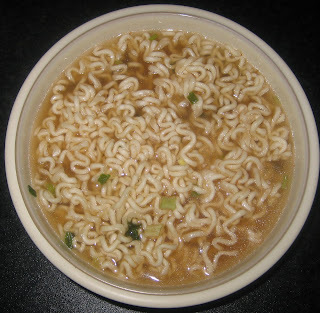 I quite enjoyed these noodles despite the mild broth. It bears little resemblance to the Japanese style udon that most of us are familiar with, but still provides a satisfying experience if one is looking for a simple and hearty broth. Typically I avoid this kind of noodles due to their plainness, but it's nice to have one or two in the cupboard for those days when our tastebuds need a break. I've already reviewed this pack of instant noodles over two years ago, but I figured it was worth another try. They've changed the packaging, so it's possible they've changed the recipe as well. 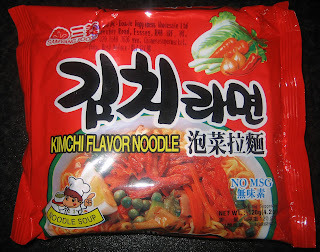 The Korean name for these noodles is much more prominent in this package although the graphics and layout remain nearly identical. It's possible that I've just obtained a different regional variant of these noodles, but there's no way for me to know for sure. The phrase "NO MSG" also appears for more prominently, perhaps reflecting an updated health consciousness. I usually like Samyang's noodles thanks to their thick and chewy quality, and this pack of noodles is no exception to the rule. They have plenty of flavor and provide a nice contrast to the spicy soup. They also give you a lot of noodles, in this case 120g. 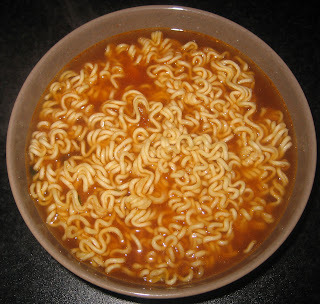 The broth in this soup is not very spicy compared to some of Samyang's other products. However, it does have a distinctive pickled cabbage taste which I never noticed before. This is a nice touch but it comes across slightly spoiled tasting instead of tasting like kimchi. They also include small dehydrated cabbage chunks to add to the kimchi theme. These noodles are pretty good, but I wish they had made it a lot spicier.